Oil on canvas; 61.6 x 51.4 cm. Nicolai Ivanovich Fechin (1881-1955) was born in Kazan, Russia on the banks of the Volga River. He would become an important American Impressionist portrait painter during the early 20th century. As a child, Nicolai Fechin learned wood carving from is father who worked as a craftsman with metals and wood. At the age of 13, Nicolai Fechin enrolled with a scholarship at the Kazan Art School which was started by his grandfather. Six years later, Nicolai began studies at the Imperial Academy of Art in St. Petersburg and his teacher, Ilya E. Repin, worked to make his students aware of the social evils in Russia and to reflect those realities in their art work. Another teacher at the school taught him to use wider, frenetic, nervous-seeming brush strokes in addition to using his fingers in the paint to convey a sense of texture. After Nicolai Fechin graduated from the Academy of Art he was a teacher at the Kazan Art School while he continued to study at the Imperial Academy of Art in Petrograd. He did so well in his studies there that he earned scholarship money which allowed him to study painting in Paris and throughout Europe. Nicolai Fechin was happy to leave Russia as this was during the Bolshevik Revolution which caused much suffering and deprivation. While Nicolai Fechin was in Europe he was fascinated by the Impressionists' style of painting and he experimented with it and with painting with a palette knife. He and his wife were quite poor and they immigrated to America with their baby daughter in 1923. Nicolai Fechin was assisted by some wealthy sponsors and they settled in Central Park in New York City. While he searched for work he continued painting and was fascinated by the ethnicities around him. Nicolai Fechin taught at the New York Academy of Art until he gained gallery notoriety. His talent at painting portraits became so well known that many wealthy people hired Nicolai Fechin to paint their portraits. During the summers, Nicolai Fechin and his family traveled west which included California and New Mexico. Nicolai Fechin suffered from tuberculosis and some artist friends persuaded him to join their circle of friends in the drier climate of Taos, New Mexico. Nicolai Fechin and his family felt comfortable in this community of adobe architecture and Indians and he became a naturalized American citizen while living there. He built a house in Taos of which he carved the doors, the window frames, the pillars, the furniture and even designed the adobe structure. He worked very hard at his painting and created many paintings and portraits of Indians, Mexicans and cowboys. These paintings are regarded as among his best work because of the exotic subject matter, high degree of modeling of the faces, and forceful, intense coloration. He also did impressionist wood sculpture. Due to a bitter divorce, Nicolai Fechin left Taos in 1927 and his daughter traveled with him. They went to New York for the winter and then on to Los Angeles at the invitation of the renowned Los Angeles art dealer, Earl Stendahl. For the next ten years, Nicolai Fechin and his daughter lived near each other in Hollywood Hills, California. 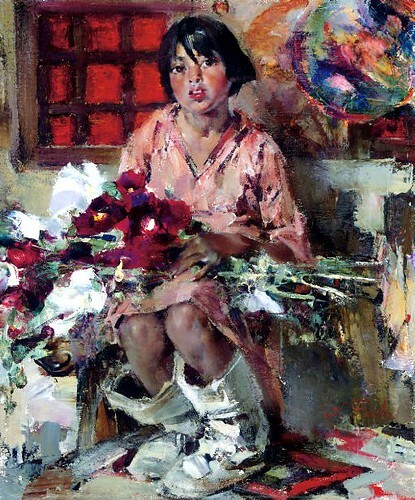 Nicolai Fechin was very well received in Los Angeles and this popularity along with the sales of his artwork picked up his spirits considerably. Toward the end of his life, Nicolai Fechin was persuaded by his biggest collector and good friend, John Burnham, to have a simultaneous retrospective at the art museums in San Diego and La Jolla. The events were huge successes and a chance for Nicolai Fechin to see paintings he had not seen for many years.